Get increased bang for your buck, the 5th Element Stella Plus Inline Skates are a slick looking, stylish and well-constructed skate when you are looking to go out and have fun while perfecting your skills. It has a subtle yet cool style and the comforts to match. An Aluminum Chassis is great for power transfer so you will not get fatigued as early and the ABEC 9 Bearings that combine with the 84mm wheels will help keep the speeds up and going with each stride. With an 82A durometer these wheels are perfect for both indoor and outdoor skating. The Soft Boot will keep your feet in good shape and you can lock yourself in with the laces, strap and buckle so that you have all the support and stability you need. A ratcheting ankle strap adds to the support and stability so you can get that just right fit you have been searching for. 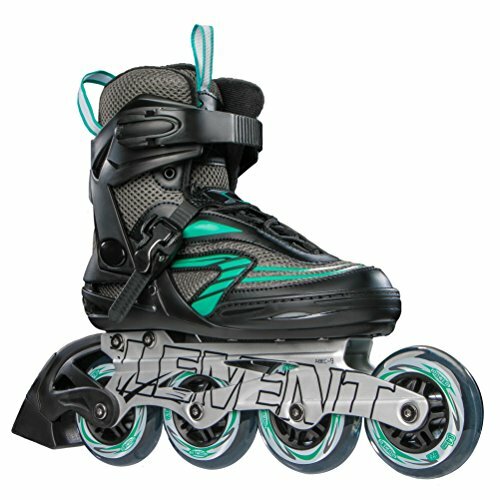 Excellent for the more experienced skater who is looking for a little more speed, the 5th Element Stella Plus Inline Skates offer tons of value and lots of fun. When you want performance and fun, no other skate at this price point can offer you the same thrills and functionality as the Stella Plus. Everything Needed for Fitness Fun - Designed for a combination of speed, comfort and performance, the Stealth 84 is ideal for everything from recreational fitness to high-speed performance training. Skate with Style and Strength - The Stealth 84 has a clean and appealing design, plus an all-aluminum chassis that adds more power with every stride. Strap in and Skate - Its incredibly easy to lock yourself in tight with a combination of the laces, strap and buckle, so you can spend more time skating and less fiddling with the fit. Roll Fast and Smooth - The combination of 84mm wheels and the top-rated ABEC 9 bearings offer more precision and speed with less effort.